On most mornings, I make a veggie omelette. Other times, I’ll eat banana pancakes (highly recommended!) or a bagel with cream cheese, spices, and veggies. All of them are fool-proof favorites that I can eat every single day. But lately? I’ve been really into crazy French toast recipes. 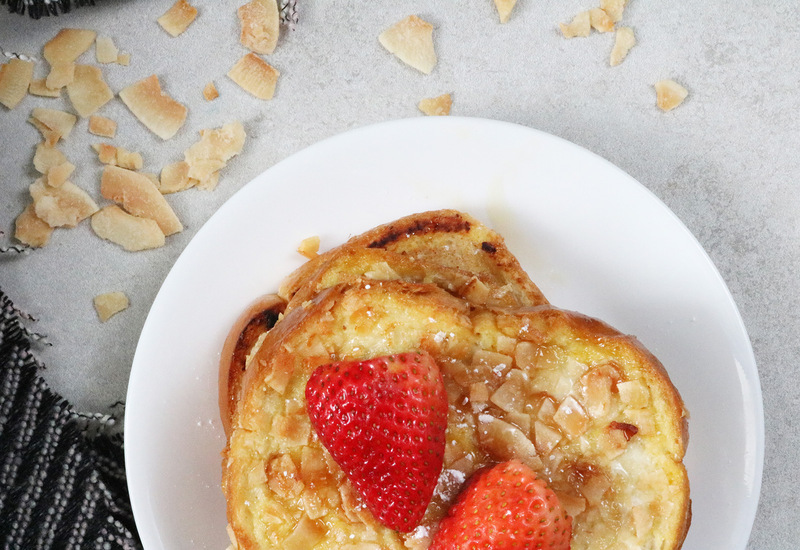 It all started with this gingersnap-crusted French toast recipe that I made for Extra Crispy. Ever since then, I’ve developed an obsession with this classic breakfast. The love is real, folks. So when I got to try out Bare Snacks‘ coconut chips, you can probably guess what happened next. 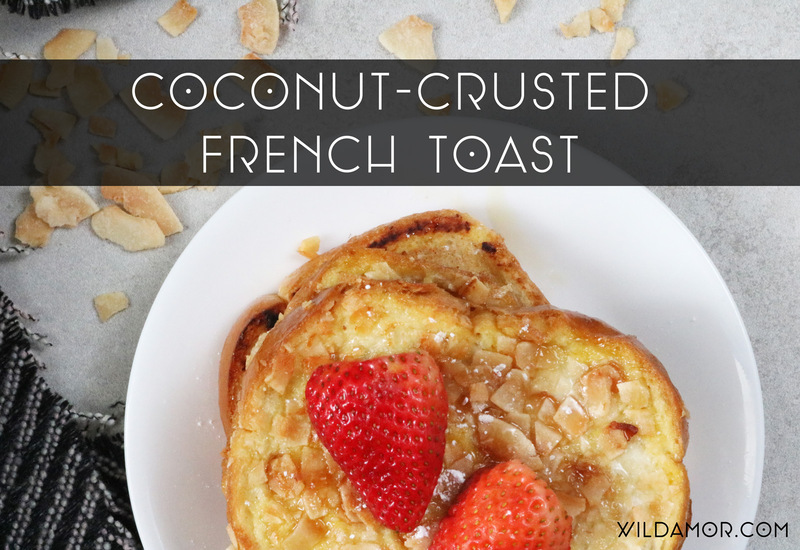 This coconut-crusted French toast was born! I went with the classic Toasted flavor, but there’s coffee (!!!) version, too. These simple chips are organic, gluten-free, and have zero preservatives, trans fat, and cholesterol. They have just enough sweetness to satisfy that craving. Basically, they’re pretty freakin’ awesome. 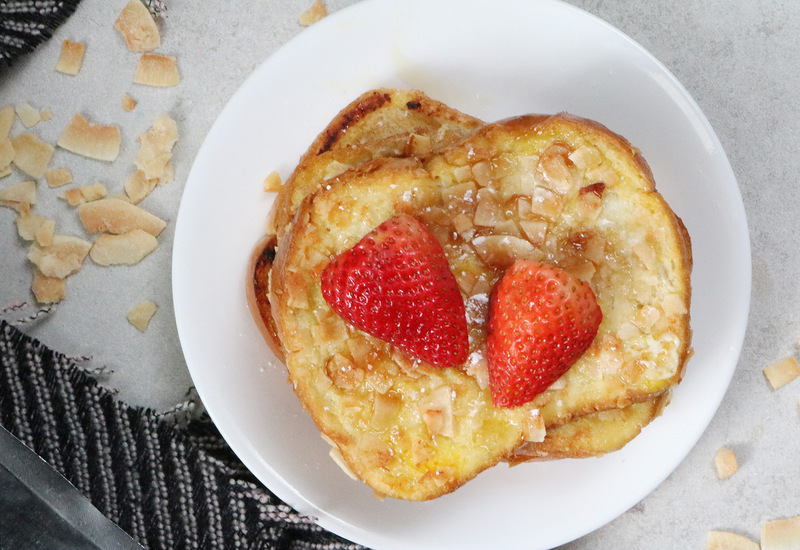 You’ll never look at French toast the same way again. In a bowl, beat the egg, milk, and vanilla together. Add the coconut chips onto a plate. Dip both sides of each bread slice into the egg batter. Don’t let it get too soggy. Cover both sides with coconut chips. Cook both sides until light golden brown. If you’d like, top with powdered sugar, coconut whipped cream, fruits, and/or honey. You can also give the coconut chips a quick whirl through the food processor for a finer coating. Otherwise, they work fine as is. I’m obsessed with this recipe, to say the least. Next up? French toast covered with Bare Snacks’ cinnamon apple chips. Something tells me it will taste like fall. I’ve spotted Bare Snacks at my local Target and ShopRite, but you can use Bare Snacks’ store locator to see where it’s sold near you. You can also purchase directly from the Bare Snacks website. Happy French-toasting! FTC Disclaimer: Bare Snacks Toasted Coconut Chips was provided by Bare Snacks and RKPR Public Relations. All thoughts and opinions are my own; I only collaborate with and feature companies that I truly support. Thank you, Bare Snacks!